Malawi national football team Head Coach Ronny van Geneugden (RVG) took charge of his final match as Flames mentor with a barren draw against Morocco in a dead-rubber 2019 Africa Cup of Nations qualifier at Bingu National Stadium in Lilongwe yesterday. RVG signed a two-year contract with Football Association of Malawi in April 2017 and the two parties have not come out clearly on the future of the deal. The Belgian deployed a 4-4- 2 formation with Gabadinho Mhango and Khuda Muyaba leading the frontline. Morocco showed seriousness to get a result from the match with a shot on target from a freekick as early as the fourth minute but Flames goalkeeper Ernest Kakhobwe was equal to the task. Malawi continued to live dangerously and conceded several freekicks that the visitors failed to utilise. The Flames’ first attempt on goal came in the 14th minute through Gerald Phiri Junior who shot straight into the palms of Morocco’s goalkeeper El Kajoui Mohir. A minute later, Malawi wasted a grand opportunity after Gaba failed to find the target from a brilliant solo run on the left. Deep into the first stanza, Morocco’s Hadraf Zakariam saw his attempt brilliantly denied by Kakhobwe. The North Africans had the ball in the net with five minutes to recess but the goal was disallowed for a foul on Kakhobwe. The Nyasa Big Bullets custodian was again called to duty in the dying minutes of the first half to deny Zakariam again. The two teams went for half time still deadlocked 0-0. Action in the second half started on a low note as players for both teams struggled to play under a downpour which eased down later. RVG changed tactics in the course of the game by pulling out Gaba for Binwell Katinji whose stature matched the tall Moroccan defenders. But not much changed as Morocco continued to pile pressure on their hosts in search of a goal. Malawi tried to come back into the game by pulling out Muyaba for seasoned Micium Mhone but Morocco continued to dominate, hitting the post in the 80th minute. There were unpleasant scenes in the dying minutes of the game as supporters threw missiles on the pitch to express displeasure with decisions of the referee who appeared to be biased in favour Morocco. The Flames were lucky to escape unharmed in the dying minutes of the game as the Atlas Lions hit the post twice. 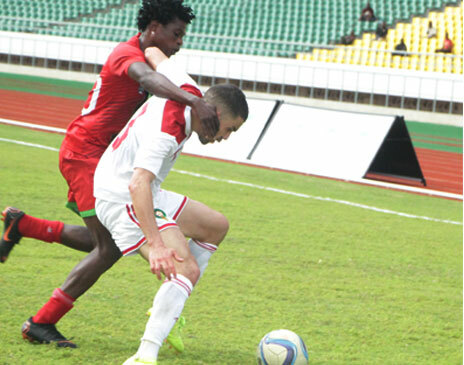 The match eventually ended goalless to take Malawi to five points from six matches. Morocco consolidated their lead in Group B with 11 points having already qualified for the finals. But the under fire RVG said despite losing some games in the qualifiers, he is proud that his side did not register a loss at home. “We have lost three away games but at home we showed some great quality because we played against very strong teams,” he said. Morocco Coach Herve Renard said his side was unlucky not to score during the game having hit the post twice. “I am very happy with what my team did on the pitch. We got some chances but de did not score. We used the game to assess some of thé players as we are preparing for thé Afcon finals,” Renard said. Malawi-Kakhobwe, G. Chirwa, Cholopi, Lanjesi, Sanudi, Banda, C. Chirwa, Chester, Phiri Jnr, Mhango, Muyaba. Morocco-Mohir, Oualid, Badr, Yunis, Abdelkarim, Youssef, Mehdi, Abdehlah, El Kaabi, Oussama, Zakariam.